This article is about the treasure which is just the head of a rubber duck. For the full body treasure, see Rubber Ugly. The Paradoxical Enigma (超存在?, lit. 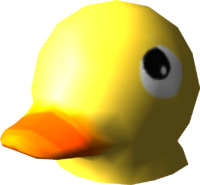 : "Super Existence") is the cleanly severed head of a rubber duck and a treasure in Pikmin 2. It is found on the second sublevel of the Citadel of Spiders. It may be guarded by Fiery Dweevils or Yellow Wollywogs. It should be noted that while Captain Olimar apparently thinks this is a great work of art, he considers the Rubber Ugly an atrocity. The Paradoxical Enigma being analyzed. A rubber duck from the real world. French Enigme Paradoxale Paradoxical Enigma The "E" of "Enigme" should be "É" instead. This page was last edited on December 12, 2018, at 07:53.